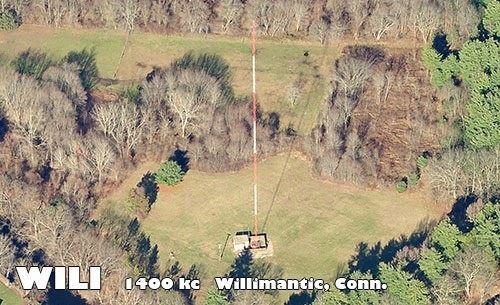 Logged WILI transmitting 1 kW on 1400 KHz from Willimantic, CT, 40 east with a steady S-4 signal. Equipment used a C. Crane CCRadio-SW receiver and C. Crane CC Twin Coil Ferrite antenna. WILI is number 171 in my AM log. Above image of the WILI transmitter site is courtesy of Bing Maps.